Why Participate in the MagsΜnchies Program? 1. Because you will learn great entrepreneurial skills like Goal Setting, Decision Making, People Skills, Money Management and Business Ethics. 3. 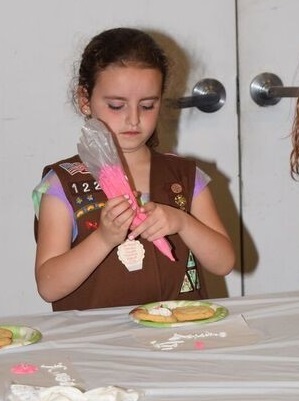 Because your Troop will earn funds to do exciting girl-led events, community service and take action projects. 4. Because you’ll have an opportunity to earn special patches and cool rewards. 5. Because it’s great practice for Girl Scout Cookie season! 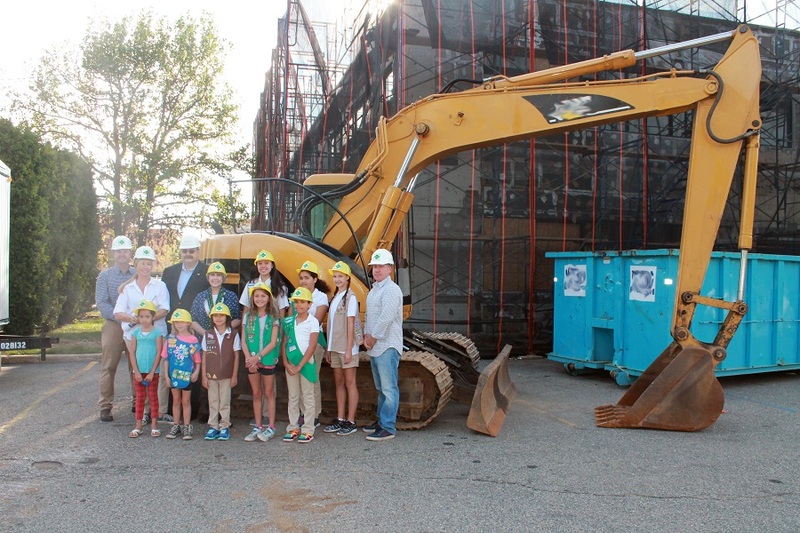 Did you know that once the product is paid for, all of the remaining revenue stays in Nassau County to help our girls explore and do great things? What do Girl Scouts really do? This is a true story shared by one of our Program Specialists. I am not sure if she expected the answer she got, but I do know that she did not want to be convinced or cajoled. She wanted the facts. I am sharing the facts with you as I did with her at the start of the summer. This past school year girls from all over Nassau County participated in programs where they explored the barrier islands and dissected dog sharks at the Sports Fishing Alliance Center. They learned proper archery form at C & B Archery; having seconds to prepare for a target game that challenged their newly acquired skills. More than 180 girls prepared themselves for summer jobs by earning their Babysitter badge at Saint Joseph Hospital. Still others learned how to build and launch rockets and interpret authentic human skeletal remains for gender, age, trauma, and disease at Garvies Point Museum and Preserve. They built robots, operated flight simulators and they packed their bags for an advocacy trip in Albany. Girls choose to do all sorts of things to explore the world they live in because at Girl Scouts they can; their voice counts, their decisions matter, their actions are impactful. It doesn’t take long for them to understand that their experiences make them interesting, unique and are the foundation for their life choices. Most Girl Scouts take pride in selling cookies because they know where cookies come from... Girl Scouts was established in 1912 by Juliette Gordon Low. This being an election year, I must tell you that Girl Scouts existed eight years before women had the right to vote in 1920. Juliette was notorious for refusing to accept no for an answer and in this capacity her tenacity served women and girls quite well. Getting back to the cookie business. Juliette quickly realized that the girls needed money to fund their experiences. Most of the girls lived on farms. They had access to eggs and farm animals. So, first they sold eggs. Then they sheared their sheep and Juliette sold the wool to local merchants. They sold other things too, but with farm fresh ingredients at their disposal, cookies became their top selling product and still is! 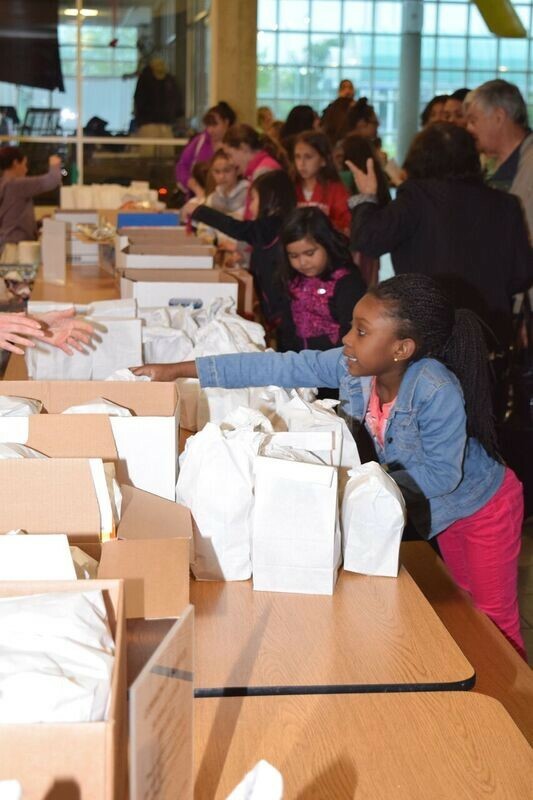 Today, girls run a $700 million cookie business. Girls fund their fun all year with a percentage of the profit. For many, this experience is their first memory of their desire to be a leader with business skills. Many Girl Scouts camp. 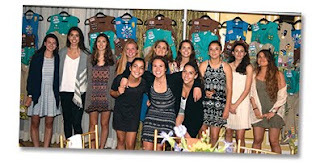 Girl Scouts of Nassau County owns the magnificent Camp Blue Bay in East Hampton. Camping wasn’t our idea, it was Juliette’s. Juliette wanted girls to have the opportunity to appreciate and explore the outdoors in a time period when girls spent much of the time indoors doing things like cooking, sewing, and reading. Juliette herself grew up doing all kinds of things inside and out; climbing trees, fishing, painting and sliding down the spiral bannisters in her family’s home. Most girls did not have that exposure. Today, we encourage girls to embrace the outdoors; learning everything from kayaking and swimming to rock climbing and repelling. And that is why Girl Scouts camp! Crafting is a special part of our history. Juliette Gordon Low was a talented artist. She painted, sculpted and even tried her hand at welding the gates that she designed for her home. Juliette used her talent to cope with her disabilities. She was a positive person who knew how to work smart rather than hard--- long before that phrase was coined. Girl Scouts share our founder’s attitude of gratitude and embrace her take charge spirit. They volunteer their time, energy and skills to those in need just as Juliette did when she cared for soldiers with her mother during the Spanish American War. Juliette was a little girl during the Civil War. She was not a stranger to hunger, sickness and sacrifice. She learned what was important early on… God, country and people. Juliette’s goals are embedded in the Girl Scout Promise and her values, simply written in the Girl Scout Law, are timeless, tried and true. I answered her last question this way. Because membership is a commitment to our mission, our sisterhood and our values. We are not alone, we are part of a community and once you are a Girl Scout, you are always a Girl Scout. A girl with a mission working together with a group of girls who share their beliefs succeeds at building courage, confidence, character and relationships that last a lifetime. I believe that Girl Scouts make the world a better place and she will too. 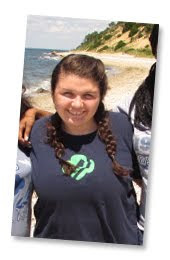 Labels: About Girl Scouts, Girl Scout Experience, Girl Scout Leadership Experience, Girl Scout Programs, Girl Scouts, Girl Scouts of Nassau County, What do Girl Scouts Do? 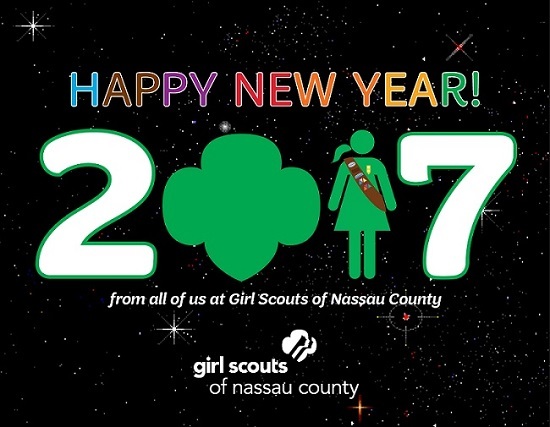 Our Girl Scouts of Nassau County staff is here for you! There are two staff people, one from our Volunteerism team and one from our Membership team that will help you start your Girl Scout year right. Our Volunteerism staff person will make sure you are provided with all of the information you need like trainings, background checks, etc. Our Membership staff person will make sure they guide you with registering all of the girls in your Troop, etc. To find out the two staff members that are assigned to you call 516.741.2550. A Service Team is a group of Volunteers that are trained to help all Leaders in an Association (group of towns that are close to each other). A Service Team is comprised of Volunteers with many different roles to help you with various things in your Troop. To find out who the members of your Service Team are call 516.741.2550. Our website, gsnc.org has all of the programs available for girls to participate in, explanations of awards and patches girls can earn, all of our shop’s online merchan­dise, etc. Our social media pages including Facebook, Twitter and Instagram will show you Troops that are learning and having fun in Girl Scouting and what your Troop can look forward to! Did you just move up from a Troop Committee position to become a Lead­er or a Co-Leader? If this sounds like you, then don’t forget to complete your paperwork process! 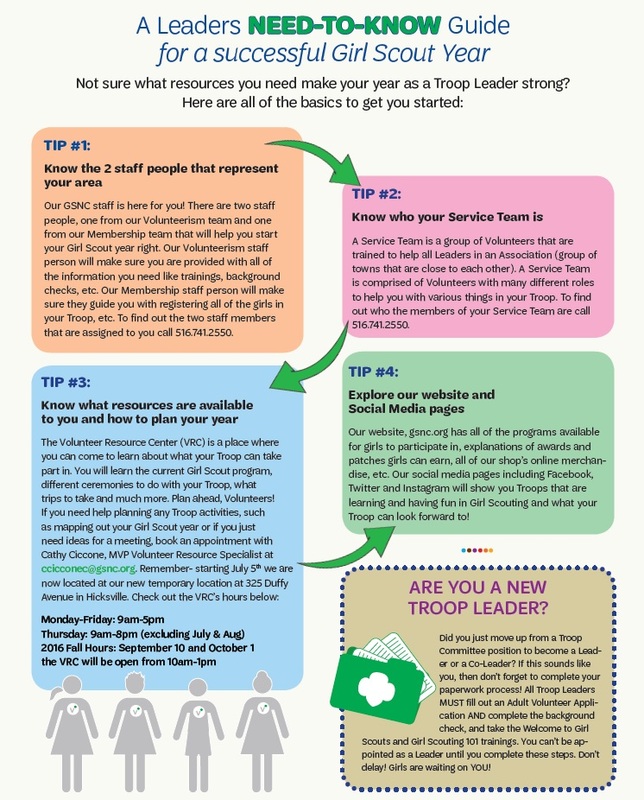 All Troop Leaders MUST fill out an Adult Volunteer Appli­cation AND complete the background check, and take the Welcome to Girl Scouts and Girl Scouting 101 trainings. You can’t be ap­pointed as a Leader until you complete these steps. Don’t delay! Girls are waiting on YOU! 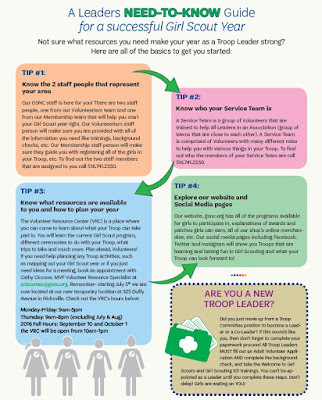 *Please note, these tips and contact numbers are geared to Girl Scout Leaders in Nassau County, NY. If you volunteer for a different council, please contact your council service center to inquire about resources specific to your area. Decide who will be on the account - Required is a minimum of 2 signatures –one of the Troop Leaders and the other a member of the Association Service Team (Treasurer or CAV). Request a letter from Council on Council letterhead: Once you have the names of the signers, the bank you wish to open the account in, and your Troop number, go to our website’s Forms/Documents Library and click on Bank Account Request Web Form. Or, contact your volunteerism or membership staff person to assist you. 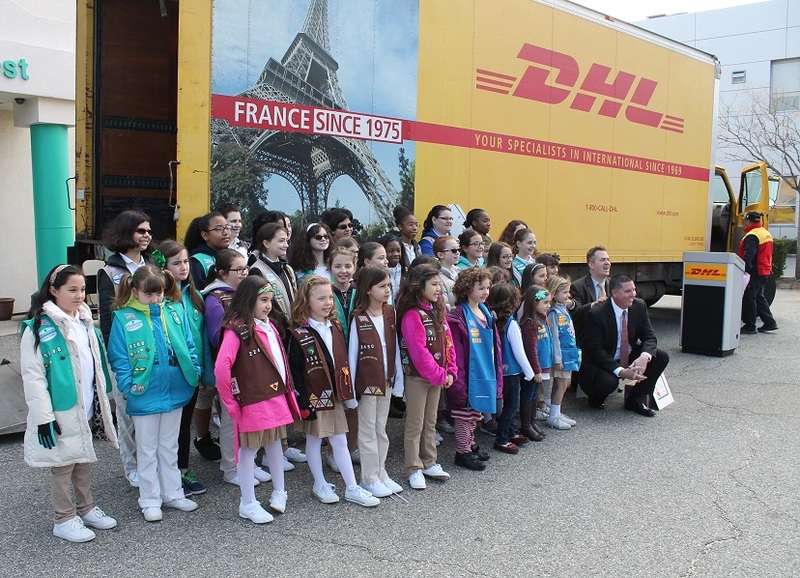 *These Banking Tips are specific to Girl Scouts of Nassau County Council. What Does it Mean to Earn the Gold Award? Girl Scouting is full of unique, incredible, and life changing opportunities for all girls involved, but earning the Girl Scout Gold Award is a life changing experience in itself. 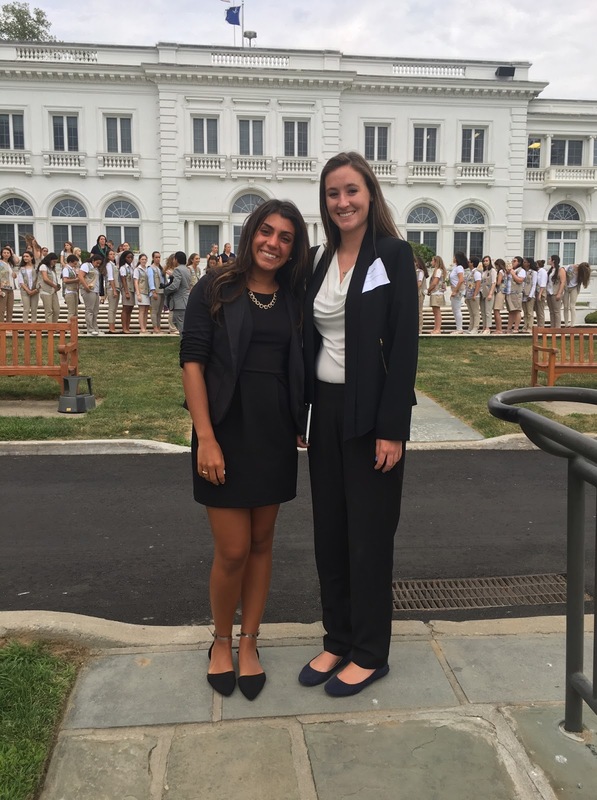 Going for the Gold is so much more than earning a prestigious award; it gives girls the opportunity to find themselves while also making a difference/impact in their community. While the journey in earning the Gold Award is unique for every Girl Scout because of the many different take action projects, the skills, connections and feelings that come out of earning the Gold are very similar. As a lifetime Girl Scout who earned her Gold Award as an Ambassador, I know from experience that earning the highest award in Girl Scouting is an enriching and unforgettable journey. It all started with an idea and identifying how I wanted to help my community. Over the course of a year and half I watched what started out as an idea, blossom into a project that helped make my community a better place, and that is what all girls completing the Gold Award aim to do. There is a great sense of pride and satisfaction in knowing you created a project that helped impact and change the lives of those in your community and beyond. Thousands of girls each year embark on the journey to earn their Gold Award, all looking to change their community and inspire change around the world. While earning the Gold Award means something different to each Girl Scout, the thing that all Gold Award recipients share, is the strength that comes from completing their project and in earning their award. Earning the Gold Award leads to a stronger and more confident sense of self, in which girls feel empowered to make a difference. Their project does not end with them, but instead carries on to continue to reach their communities and inspire change. Because girls know they can use their voice to make a change as a result of earning the Gold Award, they are more likely to take on new projects and find new ways to help their communities, all while trying to make the world they live in a better place. The Gold Award is one example of the many amazing things Girl Scouts are capable of, but the journey in earning the award is a timeless and rewarding experience that all Girl Scouts are encouraged to complete. In honor of Father’s Day, the Girl Scouts of Nassau County (GSNC) are commending the fathers who make being a Girl Scout possible and invite other Dads to step up to the challenge. Our male Troop Leaders, council members, Cookie Dads and behind-the-scenes volunteers are crucial to the success of each Girl Scout experience. The organization creates openings for fathers to be a part of their daughter’s lives and strengthen their relationships with one another through participation in numerous activities. We encourage fathers to be involved and on this holiday, thank the unsung heroes who load the camping gear into the truck, build “bridges” for our bridging ceremonies and lend a hand when needed. The Girl Scouts of Nassau County considers itself lucky to know numerous fathers interested in volunteering their time to contribute to their daughter’s, and other Girl Scout’s, experiences. These include Angelo A. and Jon W. of Bellmore, NY; Jeff S. of East Meadow, NY; Wayne G. of Jericho, NY; and Clyde R. Jr. of Baldwin, NY; who are committed to further carrying the spirit of the Girl Scouts. When a group of hopeful Girl Scouts were in risk of being put on a waiting list to find a Troop Leader, Angelo and Jon stepped up to the plate as co-Leaders. However, the ways in which Dads can contribute to the success of the Girl Scouts is not limited to becoming Troop Leaders. The seamless execution of the numerous events and activities would not be possible without the support of hundreds of men who volunteer throughout the year. Retired New York City Police Office Jeff utilizes his expertise to play a crucial role in event logistics, such as directing traffic at the recent GSNC “Girls Go the Distance” Walkathon. When GSNC Dads are not leading a Troop or volunteering at events, they are raising the world’s next greatest entrepreneurs by assisting with annual Girl Scout Cookies® sales. The GSNC is lucky to have fathers like Wayne G who was more than willing to help his daughter succeed in selling over 650 Girl Scout Cookies™ for a good cause. Wayne’s daughter Alexia, along with her troop, was able to use funds collected from the sales to donate three “Buddy Benches,” which serve as common meeting places for kids to make friends on the playground. The GSNC has the opportunity to watch Girl Scouts grow and develop from a Daisy to an Ambassador alongside their parents. Clyde of Baldwin reflects on the memories he has shared with his daughter, now 18 years old, over the last 13 years she has been involved in the GSNC. 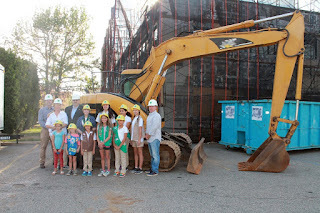 As a supportive father, he has continuously volunteered his time to help with activities, and is known in his office as the “go-to-guy” during Girl Scout Cookie™ Season. Thank you, thank you, thank you to all the dads and father-figures who help make Girl Scouting possible for their girls. We wish you all a Happy Father's Day! 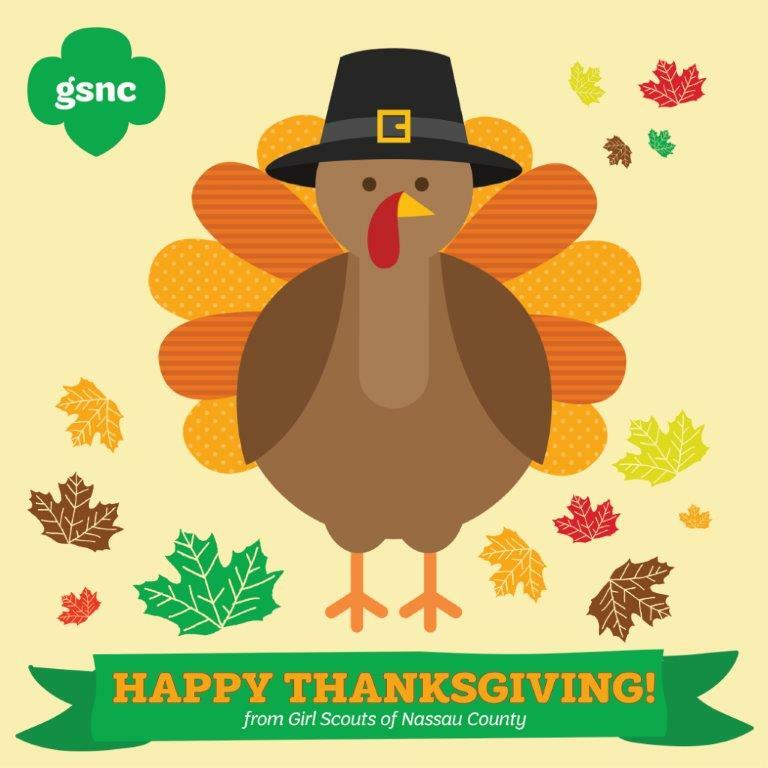 To get involved with Girl Scouts or to learn more about volunteering, visit www.gsnc.org. Hi! 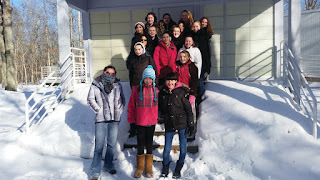 We are Troop 3095 from Jericho. This year we worked on our Girl Scout Bronze Award, the highest award a Junior Girl Scout can earn. For our Bronze Award, we decided to address the issue of loneliness on the playground. We didn’t want to see children afraid to join in with a group or to feel left out. So, we decided to donate a Buddy Bench to each of our 3 Elementary Schools. A Buddy Bench prevents bullying and is a great way to make new friends. In order to pay for our benches, we had to sell A LOT of Girl Scout Cookies. Our goal was to sell 2,500 boxes and we actually sold 2,822 boxes!! We sold to our family and friends, went door to door and had a lot of booth sales. With our cookie money, we were able to buy 3 Buddy Benches and 3 plaques to put on the benches. The plaque says, “Buddy Bench donated by Girl Scout Troop 3095”. We even had some money left over to have a pizza party to celebrate all of our hard work!! The Bronze Award was the biggest project we have participated in so far as Girl Scouts. We each had to put in a minimum of 20 hours to complete this project! Some of us were even able to put in more than the required 20 hours. To get the hours we did things like attend our meetings, attend booth sales, put together the benches and make a video. Putting together the benches was a lot of fun and challenging at the same time. We loved seeing the finished project when we were done! We also attended our District Board of Ed meeting where we explained our project and were recognized for our efforts. It was fun to stand on stage in front of everyone and we think we did a great job! By completing this project, we hope that students in the Jericho Elementary Schools will continue to be kind to each other and include others at recess. We want to inspire all of the students to help make a difference and to prevent bullying from happening. We also discovered that we can do anything that we put our minds to and we can make a difference! So, let’s go out and “Make New Friends”!! A taste of the many things Girl Scouts can do. Girl Scout Daisies through Ambassadors put their baking skills to the test at the first ever Girl Scouts of Nassau County bake off. 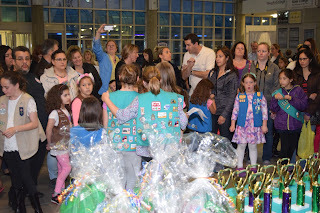 Fifty-five Girl Scouts from twelve different Associations went head to head on May 13th to challenge one another in creating tasty treats and desserts, all of which had to be made by scratch. The bake-off which took place at the Cradle of Aviation, consisted of each level baking a different treat which would be competing against the other desserts in their level. The Daisies were required to make cookies, the Brownies, well to no surprise brownies, Juniors made single layer cakes, Cadettes stirred up some tasty pie recipes and last but not least, the Seniors and Ambassadors who made an assortment of baked breads. Each girl earned her spot in the GSNC bake-off by winning her association's bake-off. The assortment of delicious baked goods were premade and brought in the day of to be reviewed by eighteen judges. The girls were rewarded points based on the taste, texture, appearance, and originality of the dessert they worked hard to make. Even though there could only be one winner of each level, all the girls who participated received metals and patches. All the treats and desserts presented were award worthy, however there were five that came out on top. The five first place winners were as followed; in Daisies Gabriella from Troop 1088 in Floral Park made a lasting impression with her Twix thumbprint cookies, in Brownies Hannah from Troop 931 in Bellmore rose to the top with her Sinkers brownies, in Juniors Samantha from Seaford/Wantagh spiced things up with her brown sugar, caramel bundt cake, in Cadettes Riley from Troop 1254 in Garden City whipped up a delicious caramel cheesecake and in Seniors and Ambassadors, Rebecca from Troop 1280 in Floral Park stirred up the competition with cinnamon, banana swirl bread. While the judging took place the girls and their families were given the chance to explore the museum. Girl Scouts were also given the chance to both, take a lesson on cake/cookie decorating from Christine Bernhard, owner and head chef of "Honestly Delicious Bakery" in Garden City, as well as create 350 non-perishable snack packs for less fortunate children at the Mary Brennan Inn, which will be handed out on Memorial Day. The event was a major success and was a taste test for the many more they plan to hold in the future. A few weeks ago we posted an opportunity for girls to enter The Museum of American Armor’s Girl Scout Leadership Challenge, which encouraged girls to submit essays that would highlight a better understanding of the heroes within our own families and those throughout our communities. Lauren’s essay received the First Place Award. The other winners are listed after the essay. We are very proud of all the girls who entered this essay contest. Please take a few minutes to read the essay – We hope you’ll find it as inspiring as we did! And, most importantly, keep those who served - and those who still serve - our country in your thoughts over the weekend. OO-RAH was a call I heard since I was a baby. Every holiday with my Pop Pop and uncles, this call was always shouted as soon as they saw each other. It took me years to understand what it truly meant though. It was used as a battle cry many years ago but today is used almost as a brotherhood type greeting. My Pop Pop was a Marine and couldn't have been prouder when his two sons later joined the Marines. Arriving from Ireland, Pop was ready to serve a country that would give him opportunity and allow him a new life. He wasn't in the US for very long before he had his paperwork in. The poverty and despair that he left in Dublin would be replaced with service and exotic travel. He loved every day of his service and loved his new country even more. His fellow marines called him Ireland and many were shocked when at the end of their service they heard him called by his real last name, Byrne. They always thought it was Ireland. He never did see action but was prepared to defend his new nation as he was stationed on a ship ready to invade during the Cuban Missile crisis. Only years later did he find out that this was part of a Navy and Marine planned strategy that would have been even larger than the Allied invasion force on D-Day. Many years later my two uncles would also join. My Uncle Jack served his four years without seeing any action but was called back months after his discharge to serve in Dessert Storm. Off he went to train for this war; my family saw him go with heavy hearts and prayers. They were proud of him and silently knew what an honor it was to defend our nation. The war soon ended just as his unit was next for deployment and he too arrived back without seeing action. Uncle Robert is the youngest in the Byrne family. He was the last to enlist, and saw the most. He and his Marine expeditionary unit were sent to Mogadishu Somalia Africa as part of Operation Restore Hope. There they provided security for both American and United Nation forces while running patrols throughout the Mogadishu International Airport and its surroundings. He was the last American force there and ensured everyone was pulled out safely. Years later it was Uncle Robert's military training that allowed him to save himself and several people when the Trade centers fell. His firehouse was the first called to the scene when the building was attacked. He was in building one when the second building fell. Again, he was one of the last to leave and pulled people to safety. It is instances like that, where I realize how much of an appreciation I have for the brave men and women who serve in the military. Many men and women devote countless amounts of their time to serve our country and protect our rights, and even risk their lives. For this we must appreciate them and do our part to make the time they spend to protect us worth it. My family works closely with the American Legion Hall in my community, in order to give back to those who serve us. My older brother collected over 800 books for American soldiers and mailed them out to distant troops as his personal project to the service men and women. My personal project took place this past Fall. I collected over 300 new and lightly used suits and jackets as part of Nassau's Veteran Stand Down fair. We believe that in addition to regularly helping support our veterans through care packages and collections organized in town, we should also personally support our current and former soldiers. They dedicated years protecting my freedom, I can certainly dedicate a few weekends of my time supporting them. I'm proud to be a Junior member of the American Legion Women's Auxiliary also. To all our service men and women out there, Semper Fi and of course OO-RAH! Second Place: Jillian K. Oceanside Troop 2228, and has earned her Silver. 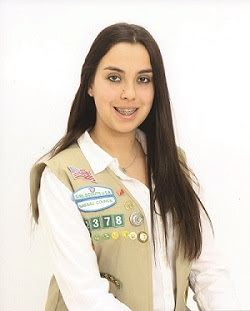 Third Place: Julia C. East Meadow Troop 2033, and has earned her Silver. Bianca L., Bellmore 971, earned Silver and is receiving her Gold in June. Why Participate in the Mags&Munchies Program?